NEW YORK CITY, NY -- Microsoft this morning revealed their next two additions to the Surface lineup: a new Surface Pro 4 tablet designed to "bring the thunder" and a surprise convertible laptop dubbed the Surface Book. Microsoft Corporate Vice President Panos Panay, who oversees all devices at the company, took delight in the slow reveal of the Surface Book, which at first appeared to be a conventional high-end ultrabook. It wasn't until 3/4 of the way through his Surface Book pitch that Panay asked the audience to "take a closer look" at the unveiling video, where it was finally demonstrated that the Surface Book's display could be detached or flipped over into an easel mode, which Microsoft is calling "creative canvas." Both the Surface Pro 4 and Surface Book come equipped with a new and improved Surface Pen, which boasts 1,024 levels of pressure sensitivity, an eraser tip and a single long button which functions as a right click. The pen attaches to the devices magnetically and is powered by a AAAA battery that offers a one-year charge. The new pen also offers interchangeable nibs (sold separately) that mimic different real world writing instruments. I was fortunate to be invited to attend the unveiling in person, not as a member of the press, but as a "Surface Fan." Microsoft identified real world product evangelists like myself for the Surface, Lumia, Band and Windows product lines and paid our travel and accommodations to the event. While we were all probably hoping for free hardware, we instead were treated to some hands-on time with the new devices. It's always difficult to judge a product in these brief encounters. For one thing, the only pre-loaded paint application is Fresh Paint, which is getting very long in the tooth and doesn't show off any Windows tablet adequately. But my first reaction to the new pen and display was very positive. The tooth of the new nib is much better, lag and parallax have been improved and initial activation force has been reduced. The Surface Pro 4 will offer an affordable $899 Core M entry level model, while the Surface Book starts at $1499 without discrete gpu and skyrockets all the way to $2699 for a Core i7 model with 16 GB RAM and 512 GB storage. Anyone on the fence about a Surface Pro 3, should definitely move up to the SP4 when it is released October 26. Whether one should choose the tablet over the laptop is really a matter of personal preference. If you need to use applications that will benefit from a discrete GPU, the Surface Book is the way to go, but you're looking at a minimum expenditure of $1899. For most users, the Surface Pro 4 and its new improved keyboard cover (sold separately) will more than suffice. I'll be in New York for another day and will get more hands on time with both devices tonight. I'll update this post with new findings before heading back to the real world. In the meantime, what do you think of the new Surface lineup? UPDATE October 7, 2015: The evening event was even more crowded than the unveiling, so hands-on time was still at a premium. I brought along my Surface Pro 3 pen and I was able to confirm that the two pens are interchangeable. The inking experience is exactly the same between the Surface Pro 4 and Surface Book. The detached Surface Book display is amazingly lightweight. Tactile feedback with the new pen's nib and eraser was significantly better. I was only able to test in OneNote, but varying pressure provided different levels of drag that are not present in the old pen. Drawing out slow diagonal strokes with the SP3 pen, it was impossible to avoid jitter. With the new pen, jitter was still present, but dramatically reduced. Increasing my stroke speed slightly eliminated the jitter altogether. The eraser tip is amazing. Truly feels like a rubber eraser. The pen has a magnet along its flat edge that connects to other magnets in the Surface Pro 4 and Book. The SP3 pen will attach to the new tablets but the magnetic hold is much weaker. The keyboard of the Surface Book is much better than the type keycovers of the Surface Pro 4; however, the keyboard is still inferior to the typing experience offered by a Lenovo Thinkpad. The larger glass trackpads are excellent: probably the closest to Apple trackpads found on Windows devices. Battery life of the Surface Pro 4 is 9 hours. 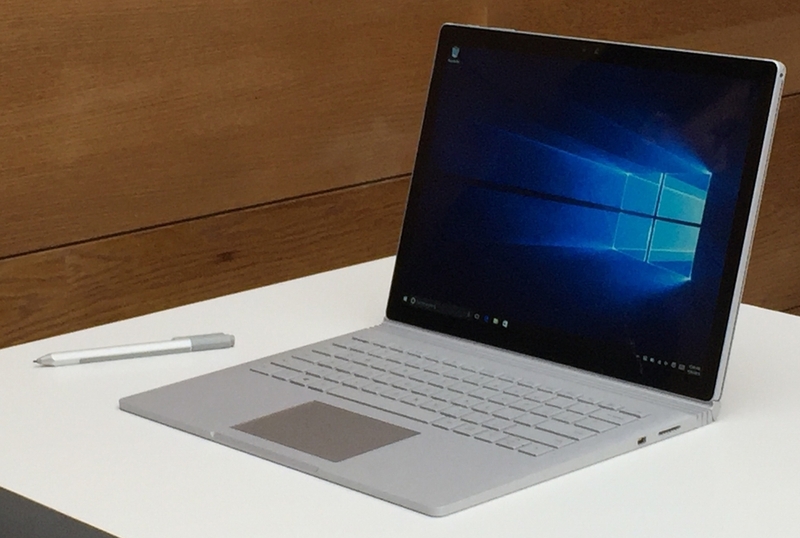 The Surface Book will offer 12 when configured as a laptop. But when the Book's display is detached, it will only achieve 3 hours. Microsoft representatives were tight lipped about the precise hardware choices in the two devices. All I could get was that both use sixth generation Intel Core CPUs (dual core, not quad) and that the NVidia gpu in the Surface Book is a custom design. The choice between the two really comes down to how much importance is placed on lapability, keyboarding and GPU performance. Gamers, animators and video editors should clearly choose the Surface Book. Artists should be more than satisfied with the Surface Pro 4. For me, I'm looking forward to trying out the entry level Core M Surface Pro 4, which is $899 and will be the only fanless device in the lineup. The reduced weight and thickness, silent operation, long battery life, larger higher resolution display and improved pen should make it the ideal mobile sketchbook.